The elbow joint is a joint made up of three bones: upper arm bone (humerus) and the two bones in the forearm (radius and ulna). Muscles, ligaments, and tendons hold the elbow joint together. The elbow is a combination hinge and pivot joint. The hinge part of the joint lets the arm bend like the hinge of a door; the pivot part lets the lower arm twist and rotate. Little Leaguer’s elbow affects pitchers and players who throw repetitively, which creates a strong pull on the tendons and ligaments of the elbow. Repeated pulling can tear tendons and ligaments away from the bone and may pull tiny bone fragments with it. This can disrupt normal bone growth. The general guideline for how many pitches a child can safely throw each week is 75 for 8-10-year-olds, 100 for 11-12-year-olds, and 125 for 13-14-year-olds. This includes both practice and competitive play. To prevent throwing injuries, young pitchers should only play three to four innings each game. Little Leaguer’s elbow may cause pain on the inside of the elbow, restricted range of motion or locking of the elbow joint. A child should stop throwing if any of these symptoms appear. If left untreated, throwing injuries in the elbow can become complicated conditions. If a child suffers from any of the symptoms of Little Leaguer’s elbow, seek professional orthopedic diagnosis and treatment at Direct Orthopedic Care. Younger children respond better to nonsurgical treatments, rest, and ice to reduce swelling. 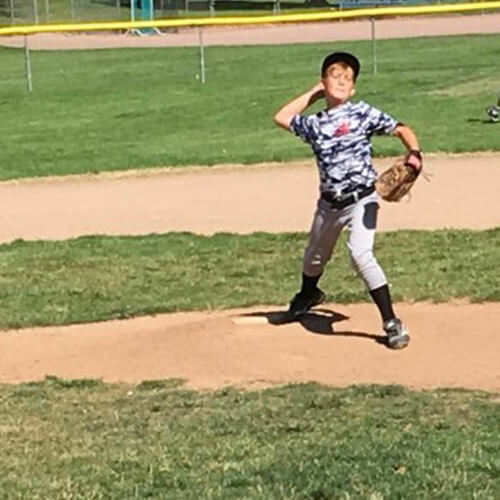 Continuing to throw with Little Leaguer’s elbow may lead to major complications and jeopardize a child’s ability to remain active in a sport that requires throwing. Depending upon a child’s injury, surgery may involve removing loose bone fragments, bone grafting, or reattaching a ligament back to the bone. The orthopedists at DOC are highly qualified to treat sports injuries, including Little Leaguer’s elbow.